Manteswamy was a folk hero who lived during the 15th century. Legends are built around his life. Manteswamy is a living tradition in and around these regions. He was born to Shivasharana Kodaikal Basavanna & Nilambhike. He is considered as one of Manteswamy’s first disciples and on the same breath he is referred. 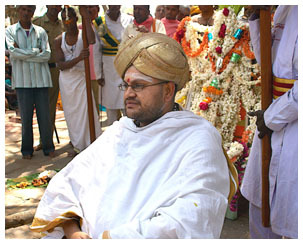 Sri Siddappaji was the disciple of Manteswamy. He lived between C.E. 1535 and 1585. He continued the legacy of Manteswamy and carried forward the Neelagara tradition. Shri Doddamma Tayi, was the wife of Shri Rachappaji. Followers of the Neelagara tradition used to respect her as their mother (‘Tayi’ is mother in Kannada). She was the daughter of a hunter in Hampi. She along with brother Rachappaji and others chose Yedathore as their place of service and practiced ayurveda to treat villagers. Through his writings Shri Manteswamy opposed casteism, inequality, disparity between the rich and poor and untouchability that existed in India even during his time. The Kappadi Jathre is held from the day of Mahashivarathri festival to the day of Chandramana Ugadi festival. This Kshetra did not have any buildings till 1968. Shri Manteswamy arrived at Adi Honnanayakanahalli around 1570. A shrine has been built at the place where he stayed, along with an ashram, that attracts thousands of devotees. Thereupon, the Malavalli Matha has undertaken many developmental works at the Sri Kshetra. Anna Dasoha is held at the Matha during the Jathra period. So the trio took up the task of spreading their philosophy and reached this place. After their demise, Rachappaji and his sister were entombed here. While at Kappadi, you can also visit the simple shrine of Siddappaji, another saint, the sacred bull called Manteswamy Basava, Kadebagilu, the entrance to the shrine, Pada Gaddige and Uriyuva Gaddige where the saints were known to give an audience to their devotees.